I’m not sure what is more fun when it comes to piñatas – watching the dads whack the daylight out of a seemingly impenetrable piñata or watching the kids scramble on the ground like vultures for the piñata goodies. The majority of piñatas available feature commercial characters. 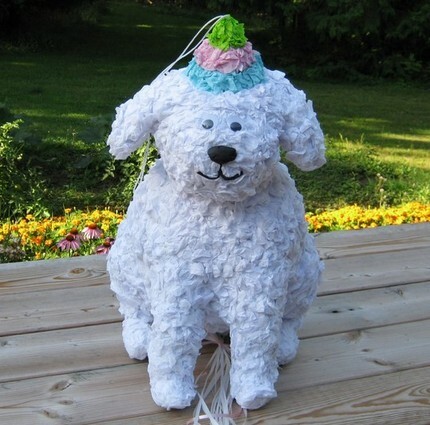 If you happen to be having a party where friendly trains, a certain little girl with a backpack or a yellow sponge man are NOT part of the theme, then pick up your piñata at Etsy store Birchangel Pinatas. With everything from garden gnome and strawberry piñatas to cows, lollipops and mermaids, Birchangel features custom made piñatas to suit every party theme. The piñatas are made from recycled paper and cardboard and are available in the traditional style (that you take to with a stick) or the ‘pull-string’ variety that is perhaps a more suitable choice for very little children – they still get the excitement of waiting for the goodies to release but without the unpredictable stick waving. I love the Very Hungry Caterpillar piñata and the range of cupcakes. Prices range from US$24-US$45. Contact Birchangel via Etsy for shipping rates to Australia.